Who doesn’t know tomato soup and grilled cheese go fantastically together? It is spring here in Connecticut and approaching Memorial day weekend. As with many years, New England never really has a true Spring. The temperatures fluctuate like crazy, so here I find myself on a foggy cool day in May wanting some tomato soup and grilled cheese. Put the quartered onion, whole garlic, fresh tomatoes and red bell pepper on a baking sheet. Drizzle with 1 TBS of olive oil and lightly sprinkle with salt and pepper. Roast for about 20 – 30 minutes or until the vegetables start to shrivel and slightly char. Not BURNED. In the mean time, in a large stock pot (you will need at least a 6 – 7 qt pot), add the other TBS of olive oil, chopped onions, shallots, and celery and celery leaves. Saute and slightly caramelize. Add in the roasted vegetable, chicken stock, both cans of tomatoes, V8 juice, sherry and sugar. Let simmer for 2 hours stirring occasionally. Put the cream/milk into a small sauce pot and warm over low heat, stirring often. This will bring it to the same temperature as the soup so it does not curdle when you add it. Use an emersion blender or ladle the soup into a blender (in batches), add in basil leaves, parmesan cheese, cream cheese and puree. Strain if you want a smooth tomato soup. Me – I like the extra pulp. Put all back into a clean pot and bring to a light simmer over med-low heat. Add in the cream. Continue to stir and taste. Adjust seasoning – salt, pepper – as needed. Let simmer for 15 minutes, then it is ready to serve! TIPS: You can skip the roasting, but I would recommend getting a jar/can of roasted red peppers to add. It really makes this soup. Do not Skip the sautéing of the vegetables. There are several ways to make grilled cheese, however, the most important is how to sear the bread, Crisping the bread on both sides makes a big difference, especially if you add more than cheese. In a cast iron skillet (or other pan you like), Heat the pan over med heat. Butter both slices of the bread on both sides. Next build your sandwich. Place the bread on a plate or cutting board raw side down. On the side you just browned, add the cheese to one side of the bread. Place the other slice of bread on top. Place the sandwich in the hot pan and sear on one side for 2 minutes (over med – med low heat), then flip and do the other side. Take off heat, give it a minute to sit, then slice and serve with the soup. ** You could do it under a broiler, however, I have found the browning uneven with this method. I hope you can enjoy this year round. It really is the true food paring! Have fun with it! Posted by culinaryease on May 21, 2015 in Cooking for two or less, General Cooking, Parties, Appetizers, and More, Recipes and tagged Creamy Soup, grilled cheese, Soup, Tomato, tomato and basil, tomato soup. My son loves Burger King’s Chicken Fries. However, they go on and off the menu like bell bottoms in the fashion world. To be fair: bell bottoms go by so many names: boot cut, flared, yoga pants, whatever it is called now, they are still bell bottoms in my opinion.. and yes, I love the yoga pants and boot cut. Just wish there was a length between tall and short. I am medium/average height (5′ 4″) (. So I am either rocking floods, or tripping over my pants. 😉 But this is a cooking blog, not a fashion blog. So let us get back to Chicken Fries. Since they are my son’s favorite take out, I decided to figure out how to make them. I did some searching online and found the copy cat Burger King recipe that is all over the web. Of course I tried it. I also tried to go all chefy on it and decided to brine my chicken first. Well, After a couple bites all I could tasted was salt. I could not tell if it was coming from the chicken or the coating. It was soo salty I choked. So I ate some chocolate – surely chocolate will get the salt taste out of my mouth 🙂 I really wanted to figure out if it was the chicken or the coating. Technically, brining should not cause meat to become salty, but tender and juicy. I determined it was a combination of both and just threw the entire batch out. I dumped the remaining brine and then put the remaining raw chicken in just plain cold water over night to rid it of extra salt. It seemed to work, however, I figured I would just work from scratch. I cooked up the “bad” chicken and my dog was very happy. Off to the store for a new batch of chicken tenders and back to the drawing board. Chicken Fries are basically a kicked up version and different cut of chicken tenders = Fried Chicken. The easiest form of chicken to cut into french fri-strips? Chicken tenders. Remove the white tendon, and then just cut in half length-wise and voila chicken french fry shape. You can cut again in half width-wise to make two pieces for little kids, if you wish. Instead of putting all my eggs in one basket like I did for the copy cat recipe (Why would it not work?) I fried a few samples until I got the flavors and texture I wanted. It turned out great and my son is very happy with the results! I have success! 1 package of Chicken Tenderloins (~7 – 8 per package), remove white tendon if sticking out, and cut in-half length-wise. Create the below all in separate shallow containers/dishes. This will be used in stations for coating the chicken. Combine Cayenne pepper, Old Bay, Granulated Garlic, Granulated Onion, Chili powder, Paprika, about a tsp of fresh ground black pepper and about 1 tsp of Kosher salt. Stir well. Put into an air proof container for unused portions. Extra can be used on roasted chicken, fish, ground beef for tacos, shrimp, etc.. Combine Flour, 1 tsp salt, 1 tsp fresh ground pepper, 2 pinches of rub mixture from above. Stir to combine. Combine bread crumbs, Shake and Bake and 2-3 TBS of the Rub mixture. For stronger flavor, use more rub mixture. Stir to combine for even flavoring. I recommend using latex gloves -anytime you handle raw chicken and poultry. You can pick up the powder free kind at any drug store in the first aid isle for cheap. I also use them when handling hot peppers or when I cut myself and need to keep on going. Great asset to have around the kitchen. TV shows say use one had for dry and one for wet. I always end up with multiple trips to the kitchen as they always get mixed up and I end up with glue all over my fingers. I decided to try a new way today and it worked great. There is this new invention called FORKS. One for each bin. My fingers were glue free and I escaped the issue of the stuff on one hand taking off the stuff on the chicken. Set up on baking tray with metal rack on top (if you don’t have a rack, just skip it). Then set up your dipping order. Raw chicken, flour, egg, coating and baking tray. In that order. Coat in flour mixture, turning with the fork, lift up with the fork and shake off extra, transfer to egg. Coat in Egg mixture, turning with the fork to cover all, shake off extra and transfer to the coating. Coat all sides completely in the coating mixture, using the fork to turn then place on the baking sheet. Repeat for all pieces of chicken. Let stand for 20 minutes. In the mean time, in your cast iron pan (or deep fryer if you have one), bring the oil to 350 – 360 degrees (med high heat – NEVER ON HIGH HEAT). The oil in a cast iron pan or Dutch oven should reach no more than 1/2 way up the pan. A deep frying has a built in temperature gauage. You can purchase a Oil/Candy thermometer at any grocery store for a couple bucks. This is good to prevent burning of food, etc. Always good to have on hand. Once you reach 350, you are ready to start frying. Add no more than 4 – 5 pieces at a time. The reason for this as the temp of the oil will reduce too uch and you will end up with greasy and potentially under cooked soggy food. Cook for about 2 minutes per side if using a pan/cast iron or 4 minutes for deep frying, or until golden brown. Because this is thin cut, it does not take long at all to cook. Keep in mind, food continues to cook once removed from the oil and will deepen in color. Remove to a new clean baking tray with rack, or a baking tray lined with paper towels to absorb extra oil. Let the temp of the oil come back to 350 before starting the next batch. Before you know it – your new tray is empty because either you are eating them or your family is walking by and taking them off the “done” tray before you even get to the sauces. Sauces are easy. No recipe here. Store bought BBQ Sauces, Hot Wing Sauce, Hot Sauce. I always mix and match. Take a sweet and sour and add hot sauce. Whatever your family likes. Hope you enjoy this version of Chicken Fries you can do at home and are easy and delicious! Posted by culinaryease on April 5, 2015 in Cooking for two or less, General Cooking, Parties, Appetizers, and More, Recipes and tagged Burger king, burger King Chicken Fries, Chicken Fries, chicken tenders, Fried Chicken. I love this soup in the fall and winter. To make it right, it will take some oven time for the squash. If you don’t have the time, the squash can be diced small and boiled in stock (chicken or vegetable). Roasting any vegetable just gives it so much more flavor. for topping: Blend all in blender, hand chopper. if you do not have, then dice the garlic and save as small as you can and hand mix. Taste, add more sage, salt or pepper if needed. You could also use about 1 tsp of ground ginger if you wish. Let refrigerate at least 2 hours or over night. Roasting the Squash: Place the squash, cut side up, on a baking sheet (for easy clean up, line the baking sheet with foil). Drizzle with olive oil, sprinkle with salt, pepper, thyme, oregano on top of each squash half, place in oven. At this stage, start the dollop of cream for the topping so it has time to set in the refrigerator during the remaining cooking time. Every 20 minutes baste the squash – use the oil/butter mixture that has formed in the wells too. This will keep it from drying out during roasting. The squash can take 1 – 2 hours depending on thickness and oven performance. After 1 hour, start checking for doneness with a fork. When you can easily slide a fork in and out (same consistency as for mashed potatoes), then they are done. When done, remove from the oven, cover with tin foil, and let cool to touch. Making the Soup: In a cold pan, add in any remaining butter and the olive oil. Add the onions, garlic, ginger, thyme, pepper lightly saute over med-low heat. This takes about 10 minutes. You want the onions fairly clear and the ginger soft. While this is going – harvest the squash. When squash is safe to handle, remove squash pulp from skins, using a spoon, or if the skin starts to fall apart (good sign) and you aren’t afraid to get your hands dirty, just run your fingers along the skin and the pulp will just fall off. Because it is messy, kids love this “chore”. Put the pulp in a bowl until ready to use. When onions are translucent and just starting to brown, add the squash to the pan. Stir while mashing to mix the ingredients. Let simmer for a couple of minutes while stirring to blend the flavors. Add the stock and dried sage, stir to combine until well mixed. Add more water or stock if not “soupy”. This is a thick soup, but it should still be a little runny at this stage. Let the soup simmer over low heat about 30 – 45 minutes, stirring every 5 – 10 minutes, as the pulp will settle to the bottom of the pan you want to prevent burning. Using a blender or food processor, blend the ingredients together (may need to do in batches). The soup will still be a bit chunky at this point. To gain a smother soup, pour the soup through a fine mesh strainer or food-mill pressing down on the pulp to extract as much flavor as possible. Return the soup to a clean pot. Add the cream, stir and continue to simmer over low heat for about 10 minutes. Taste and add more salt, pepper or cream if needed. Serve in a bowl with a dollop of the cream topping and perhaps a small sage or thyme leaf. Yum. NOTE: You should be tasting at each step and adjusting seasoning as needed. For a kick, you can add some hot pepper, cayenne, etc..
You can also just use one type of squash and not two if you wish. If you are like me and love toasted pumpkin seeds, then, after scooping the seeds out of the squash, harvest the seeds, rinse, place on a baking sheet, sprinkle with salt, pepper or whatever seasonings you wish, roast in the oven with the squash (yes they can go in wet) for about 10 minutes. Check after 7 and stir just to be sure they do not burn. You can use the toasted seeds as a topping on the soup for a texture contrast, either whole or a quick grind. Posted by culinaryease on November 26, 2014 in Cooking for two or less, General Cooking, Recipes, Vegan/Vegetarian and tagged Acorn Squash, Butternut squash, Ginger, sage, Soup, squash soup, thanksgiving squash soup, winter soup. Most of you do not know this, in October, I tried out for the Fox Channel “Master Chef” home cooks cooking competition. While, I ultimately did not make it on the show, I did make it to second rounds in New York City mostly in part with this sauce over the foie gras I served. I served it over an apple sage chutney. That will be in another post as I am making this for my family at Christmas. Next time I try out for a competition show I guess I need to wear a bow tie and tell a sob story, neither of which I did. Live an learn. At least it wasn’t because of my food! They loved the food! This sauce is great over foie gras, but any pork or meat will suffice as a great vehicle for this sauce – it would even work with dessert. I will add a picture of the complete dish when I make this in December, but wanted to get the recipe out before Thanksgiving. Put all (Except the butter) in a sauce pot and bring to a simmer. Let reduce by half (about 20 – 30 minutes). Put a strainer over a clean pot and strain the sauce into the clean pot. Reduce again by half, you should have about a cup of the sauce left, and add in the butter, whisk well to finish the sauce. Taste. This mixture should be sweet and delicious. This keeps in the refrigerator for several days. It is best to make the day in advance. It tastes better the next day and total cooking time is close to 2 hours. Use a gentle simmer vs a hard boil to really bring the flavors out of the ingredients. Posted by culinaryease on November 25, 2014 in Cooking for two or less, General Cooking, Parties, Appetizers, and More, Recipes, Vegan/Vegetarian and tagged port sauce, port wine reduction, reduction sauce, Sauce, wine reduction, wine sauce. This past Labor day weekend my family got together in Maine. Our main Labor day weekend dinner was – Yup – Lobster! We went through over 25 lobsters. Imagine my delight at the thought of Lobster bisque on the horizon. We cleaned the shells (some of those little legs still had some meat which also helps flavor the broth), in cleaning, we remove the “rib” cage, roe, etc. Head, and all shells are rinsed and used. I NEVER throw out the shells and always take them home to make a very flavorful broth that can be frozen and used later. Some chefs grind the shells (same with shrimp bisque), I don’t, I just break them apart and use them whole. My version of creating the broth (same recipe can be used for Shrimp Bisque) works great and really extracts the lobster flavor. I was lucky that I had so many shells as I made gallons of broth and will make over 20 quarts of bisque. However, for 4 quarts of bisque, you really only need shells from about 4 – 5 lobsters. And if you are in part of the country where you do not have access to summer lobster (where the price is low), then by all means use store bought lobster broth. Whole Foods, Fairway and large supermarkets are now carrying it. I served this soup along with my clam chowder at a work “Soup Lunch” fundraising event in Nov 2014 with about 15 – 20 different soups. Both went fast, down to the last drop. They were well liked. There were other soups there I am seeking recipes for – so don’t be surprised if you see more soup recipes soon. **Note – Salt is left off intentionally. Salt will be added when used in the final soup. Adding salt now could render the final product too salty. 2.) Add in the celery, carrots, onion, herbs, bay leaves and garlic. Let sauté for about 5 minutes, stirring each minute. 3.) Add in the shells and continue sautéing for about 10 minutes, stirring frequently to avoid burning, browning is OK. this process starts to release the flavors of the ingredients. 4.) Once the aroma in the kitchen starts to make you hungry, it is time to add the water (approx 5 quarts). Add enough water (warm or hot), to cover all ingredients and then exceed by 2 – 3 inches (does not have to be exact, just all ingredients need to be covered). 5.) Bring to a light boil, then reduce the heat to med-low and let simmer for 3-4 hours or until a 1/3 of the water has evaporated. Stir occasionally. 6.) After the liquid has reduced by 1/3, place a fine mesh (small holes) strainer over a large bowl or another large stock pot, and strain the liquid into the clean bowl/pot. Discard all of the solids. KEEP the liquid. 7.) Return the liquid to med heat and reduce again by 1/3 (about 1 hour) (taste – if too watery, then continue to reduce checking every 15 minutes). You should end up with 6 – 8 cups of broth. The most important part is that you have at least 6 cups of broth and it has loads of flavor. If using the same day, keep warm over low heat while you make the bisque. If freezing for later, let cool, then place in zip lock freezer bags, releasing as much air as possible. This will keep in the freezer for at least 6 months. 1.) In a clean large stock pot (about 8 Qts) over med heat, add the oil, shallots, garlic, a few grinds of pepper, thyme and oregano. Saute until they become translucent ( about 5 minutes). You want to sweat (putting in the items with cold oil over med heat to release liquids) these, NOT brown them. 2.) Next add in the tomato paste, increase the temp to med-high. Stir every few minutes to prevent sticking and burning. It is ok to lightly brown the tomato paste at this point. Just keep stirring. This process takes about 5-7 minutes. 3.) Deglaze the pan using the sherry, stir well, and let simmer for another 5 – 7 minutes until the liquid reduces by 1/3 to 1/2. 4.) 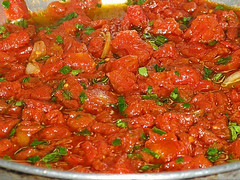 Add in the tomatoes, stir and continue to simmer for about 15 minutes. Stir every few minutes. Taste to check flavors. 5.) Fish out the stems from the herbs and discard. 6.) Puree the mixture. You can strain at this point to remove any pulp from the tomatoes, or leave them in. I usually do not strain if I pureed long enough. That is your call. 7.) Add the tomato mixture back to the pot and add in the lobster stock. Stir and simmer another 10 – 15 minutes. Taste and add salt if needed. 8.) Next add in all of the cream. Stir well and let simmer approx another 10 minutes, stirring often so the cream does not burn on the bottom of the pan. Taste, adjust with salt/pepper as needed. The liquid will reduce and thicken as it simmers. Continue to taste adjust with salt, perhaps a splash of Sherry as needed. That is it – Enjoy with a nice piece of Italian/French bread, diced lobster meat (if you have some) and you can even garnish with a few pinches of Parmesan. Posted by culinaryease on November 23, 2014 in Cooking for two or less, General Cooking, Parties, Appetizers, and More and tagged Bisque Soup Lobster. I saw in a magazine that if you roast or sauté radishes they lose their bitterness. I never use radishes much because I am not a huge fan and I figured they are only really used in salads and served raw. So of course with this new information, I had to give it a try to see what happened. Well to my surprise, a nice tasty soup same about, a cross over of winter to spring due to the abundance of fresh herbs. Similar looking to the Spring Pea soup I posted a few weeks ago, but a little more hearty as I don’t strain and I preferred this one that way. It so happens my son chose this over the pea soup, so I think I have a winner and look at all the veggies he just ate! To boot – it is vegetarian – I do use cream, but that can be replaced with silken tofu to make it vegan. I enjoyed it and hope you enjoy a new way to use radishes. Instead of making a soup, you can always just use this as a vegetable side dish. The vegetables I have listed are just a few possibilities, such as asparagus, broccoli, carrots, bell peppers, or even hot peppers to give a good zing. 1.) In a large roasting pan (9×13), put in the potatoes, cauliflower, radishes, leek, onion, thyme, oregano and toss with olive oil, salt and pepper. Then break or cut up the butter into a small dice and dot all over the top. 2.) Roast the vegetables for about 25 minutes or the tops are just starting to brown. Add in the vegetable broth (only use 1/2 of the broth if making as a side dish). Toss and put back into oven. 3.) After another 20 – 25 minutes, when the potatoes are almost done, but not quite, pull the pan from the oven and transfer the mix to a large sauce pan. If making this as just a side dish, keep them in the oven until done and serve in a serving dish. You will want to check for salt/pepper. 4.) Add in the milk, cream and spinach and simmer over med / med-low heat until the potatoes and all vegetables are cooked all the way through. 5.) Transfer to a blender (you may have to do in batches), and puree the soup. Pour the pureed soup back into the sauce pan and taste. If it is too thick, add more milk or vegetable broth. 6.) Add in the sour cream and parmesan (if using), let simmer a couple of minutes longer, stir, taste and adjust for salt/pepper. There you have it. I think the flavors come out best when it is warm, not piping hot. Let it cool before serving. Top with chopped parsley or raw radishes for a crunchy texture. Posted by culinaryease on May 6, 2014 in Cooking for two or less, General Cooking, Recipes, Side Dish, Vegan/Vegetarian and tagged cauliflower soup, fresh herbs, potato soup, radish, Soup, Vegan, Vegetable, vegetable soup, vegetarian. Isn’t all bread smeared with a mixture of garlic and butter the best ever? Well, you would think so. However, I used to think I made great garlic bread (and I did, until now), but I had an unusual request from a friend (ahh – unusual for me) to 1) not put any cheese on it and 2) tone down the garlic. WHAT???? No cheese, I could not even say – Ttttttttone down the garlic. Took me a little while to comprehend what I was being asked – it is GARLIC bread. But I like a challenge. I thought, there are many different ways to “cook” garlic bread. I not only took the challenge to find a way to “tone” down garlic, but also what was the best way to heat it. Off to the internet. As many ways as one can use garlic there are recipes and techniques for making garlic bread. Whoooo HOO, I found a great way to spend a rainy Saturday afternoon, listening to the thunder and lighting storms in the middle of January before heading off to my friends house with what I hopped to be “The Best Garlic Bread Ever”. I do get a little lengthy here, but just in an effort to give you the benefit of my fun knowledge gained in creating this recipe. You are more than welcome to skip right down to the end of this post and get to it. But if you are up for a little chatter, then by all means read on. French loaf? Italian? Skinny or fat? Hmmm does it make a difference? YES IT DOES! Splurge the extra $$ (and when it comes to bread, not a big hit in the wallet) cents to get an artisan crafted loaf either from your mega super market, or favorite bakery store around the corner. I tried two types of bread – as I automatically ruled out others as I was looking for soft light interior yet a nice crusty exterior. I chose the typical french Baguette and then a shorter baguette that was twice the width. Italian bread has too soft of an exterior, so hence the French won out. AND the shorter baguette with the wider width also won out – but the typical skinny one will do in a pinch. I happen to be lucky and live in a land of many fine and expensive stores so I was able to get what I wanted at about $1.40 a loaf and the bread was excellent and tasty in its own right. I went to the cash register with the entire bin of bread as I was cooking for a large party and then I needed some for my experiments.. and boy or boy what a great excuse to eat bread and butter all day! This was a little easier – salted or unsalted. Store brand or name brand? I was trying to impress. If I was at my standard supermarket down the street I would have splurged for a name brand. However, I was at the expensive speciality store, so I did go with their brand as their store brand is pretty much as good or better than what I could chose at my super market. But rule of thumb, go with what you can afford. The question of salted or unsalted was the easiest decision I could make all day. UNSALTED. I always cook with unsalted, as then I can control the salt of the final dish. I find cooking with salted butter, my dishes come out salty as it is easy to forget to compensate for the salt already in the butter. Am I going to use herbs? I thought about it and decided yes, I would use minimal herbs so as not to take away from the main ingredients – Bread, Butter and GARLIC. Fresh or Dried? This is a personal preference. Fresh herbs are best used in a manner they can somewhat stay fresh. Because I was going to “tone” down the garlic, that requires heat. Heat kills fresh herbs so I decided to go with what most people have in their house – dried. I already knew I as going to use the standard Italian blend. Basil, Oregano and Parsley. Some people don’t believe in oregano belongs with butter, but in this circumstance the the little amount we use, it is fine. It is also fine to omit – just increase the other two. If all you have is an Italian blend, by all means use that. If you have fresh herbs and want to use them up, by all means do, just hold off mixing them in until just before spreading the butter on the bread. This is actually an easy and obvious one. FRESH garlic. Not the head of garlic that has been sitting in your fridge or on the counter for over a week or longer. I have those to, so no judgement here. Fresh garlic you buy the day of or day or two before. It is OK to use pre-peeled garlic, as long as you can inspect them through the container to ensure they are fresh – not starting to turn opaque. If you open it up and there is a sour smell – don’t use them. I often use pre-peeled when I am making any dish or dishes requiring large amounts of garlic. However, if you are making one loaf, then get the fresh head. It takes no time at all to peel one head. Separate the cloves, smash them with the flat side of a sturdy knife, or small pot. The skin comes right off, and to boot, makes it easier to chop. To cheese or not to cheese. I am out on this. They way I made it for my friend, I did not miss the cheese. However, adding a little grated parmesan cheese to the butter mix is tasty (just be aware it does add salt). I would for-go melting mozzarella on the bread as it overwhelms all of your hard work and then takes center sage. You want the hot, steamy, bread with the garlic buttered melted, saturating the nooks and crannies with bits of fresh garlic and the butter dripping down your face to be the star of your creation – not melted the melted cheese. 1.) Toasting the bread open faced then spreading on the butter. – Great for breakfast, but not the garlic bread I dream of. 2.) Spreading on the butter and toasting in the oven open faced – If you eat it right away, ok, but the butter loses its punch. And if you wait any length of time, you might as well be trying to bite through a brick. 3.) Starting out open faced, then closing 1/2 way through – this had more staying power than the previous one, and closer to what I was looking for, but, again, an hour or so later, it was difficult to eat. The point of having the nice soft center is that you can eat it right away, later or even the next day. none of the above fit that at all. 4.) The old standard of wrapping in aluminum foil and then venting for the last few minutes of cooking. This was pretty darn close, however, I found that the bottom half of the bread was great and dripping with butter, however, the top half (the thicker half) only had part of the bread saturated. OK if you don’t want a lot of butter, but bad because the non-buttered bread neutralized the buttered bread. Now what. Rotissarie. That would be great. But I only took the concept part way there. FINALLY found the right way to cook the bread and have both sides be happy and me as the eater was finally way satisfied. 5.) Wrap the bread in aluminum foil, place it top side down (on a baking sheet to catch any butter leakage). Then after about 10 – 15 minute, turn it over and open the seal on the foil and finish it off for about another 5 or so minutes. it is finally that time to get to the recipe! Makes 1 loaf, that is approx 2.5 – 3 inches wide and about 1.5 feet long. 1 loaf of crusty on the outside, soft on the inside french or country bread, plus a couple small rolls to be used for tasting. *** Note if you do NOT want to tone down the garlic, I fully understand. Use room temperature butter, but all ingredients in a food processor (increase the number of garlic cloves if desired) and pulse until all is mixed together. Skip to step 8. 1.) Place the butter and oil in a sauce pan over low heat. 2.) When the butter is 1/2 way melted, add in the herbs and garlic. 3.) Mash/Stir all together until combined and almost all melted. The mixture should be fairly warm, but not simmering or hot. 5.) Let sit until the mixture begins to solidify again, stir occasionally to evenly distribute the ingredients. This takes about 20 – 30 minutes. 6.) When the mixture is firming up, but you can still easily stir it, add in the lemon juice and cheese if using. Stir well. Take some more of that spare bread and taste again. Adjust for salt and seasoning now. If you want a little more tang, add another drop or two of lemon juice. 7.) let it sit another 10 minutes. 9.) Slice the loaf of bread ALMOST in half length-wise. You still want it to stay attached, but be able to open it enough to spread on the butter mixture. 10.) Spread the butter mixture evenly on both insides of the bread evenly. Get that butter all the way to the edge and fill in all the nooks and crannies. 11.) Close the bread sides together. 12.) Taking your bread knife, slice the bread almost all of the way through into 1.5 inch pieces ( you still want the loaf to stay attached – easier to move around). 13.) Wrap in tinfoil, forming a seal at the top and closing the ends. 14.) Place TOP SIDE down on a baking sheet. Bake for 10 – 15 minutes until hot. 15.) No longer than 15 minutes later, turn the loaf over, open the top seal (careful as butter probably leaked out and will BURN your fingers, use tongs), then place back in the oven for another 5 – 7 minutes. Remove from the oven, give it a minute before handling, then remove the loaf (use a large plastic spatial) from the tin foil to a cutting board. Finish cutting through the pieces, put on a serving tray and watch them disappear! Have fun and let me know if you come up with any variations or suggestions for improvement. Posted by culinaryease on January 20, 2014 in Cooking for two or less, General Cooking, Parties, Appetizers, and More, Recipes, Side Dish, Vegan/Vegetarian and tagged Best Garlic Bread, Bread, Fresh Garlic Bread, garlic bread. I have many ideas for tomato sauces, as they are many opportunities to use them and I have different ingredients on hand at any given time. Below is a tomato sauce that is easy to make, takes less than an hour (in simmer time – not actual work) to have a tasty versatile sauce. It can be used with any pasta and stuffed pasta, chicken and fish dishes, etc. And it is vegetarian to boot. I made this when at the last-minute, when testing a “lasagna” type stuffed portabella appetizer. I baked it, like I do all my stuffed mushrooms, and the filling just started to spread all over the pan. So I thought – what am I going to do now? Well – I thought – it is supposed to be “lasagna”, so I decided to make a lasagna using the mushrooms in place of the pasta.. but I needed a sauce. I went to my pantry to see what my options were. One thing I ALWAYS have on hand are diced canned tomatoes. So out they came with the low salt canned plain tomato sauce. I had some other fresh ingredient staples and voila – a tasty pasta sauce was made. My neighbor happened to swing by and did a taste testing for me and agreed it was right on point. 1.) In a 3 – 5 qt sauce pot, add olive oil and onions. Saute for about 3 minutes, stirring once or twice. 2.) Add in the garlic and sauté another 3 minutes, stirring a couple of times. 3.) Add in the diced tomatoes and tomato sauce, stir and let simmer for about 30 minutes, stirring every so often so nothing sticks to the bottom of the pan. 4.) Add in the fresh herbs, stir and take off the heat. Serve just this way or blend (see Step 5). 5.) OPTIONAL – In a food processor, blender or stick blender, blend the ingredients until all the tomatoes have been processed (watch out for hot spatters). Return to low heat for about another 5 minutes and then your sauce is ready to go. There you have it. Dinner time. Herbs: If you don’t have fresh herbs, you can use 3/4 TBS dried basil added in step 2. Tomatoes: If you don’t have diced tomatoes, stewed, crushed, or whole canned tomatoes will work as well. If using whole, squish them in your hand to release the juices into the pan. Posted by culinaryease on November 12, 2013 in Cooking for two or less, General Cooking, Parties, Appetizers, and More, Recipes, Vegan/Vegetarian and tagged Canned tomato, gravy, Italian cuisine, Lasagne, Pasta, Sauce, Tomato, tomato and basil, Tomato sauce. This has to be one of the best-loved guilty pleasures I have with food. First off, if you are prepping for a game day party this is a must on your menu. Why do I call it Minnesota dip? Well, it is because I urge you to find one house hold in Minnesota that does not have velveeta in their fridge. In addition, just about everything comes from a jar or can and mixed together (usually in a crock pot) to form a great tasting stick to your ribs dip! My aunt Lisa introduced this to me probably about 16+ years ago and it always disappears. And since the ingredients are what they are, it can last just about forever and freezes very well. I always make more than I need, because I can have it for breakfast, lunch and dinner and never really tire of it and I always freeze some for impromptu gatherings. It is best served warm, so a crock pot or other such appliance is recommended. However, it can be reheated over and over and never lose its flavor. Heat it up and make sure to have plenty of tortilla chips on hand then put it out and watch it disappear. In a med large stock pot (6 – 8 quarts) Brown the ground beef and onions together in a pan, “chopping” the hamburger with a firm spatula as you go. In a colander, pour in the beef and onion mixture and shake to get rid of as much fat as possible (too much fat in the mix will change the consistency of the dip) – some rinse with warm water, but not necessary because you may wash too much of the flavor away. Reduce heat to medium. Add in the refried beans and 2 jars of salsa, hot peppers if using, and the taco seasoning. Mixing with the ground beef and until combined. Bring to a simmer. simmer for 5 minutes. Add in the Velveeta and cheese blend. Stir until all the cheese is melted. Stir regularly. If left to sit, there is a chance the dip can burn on the bottom of the pan. You want to AVOID this. If needed, reduce heat to med-low. Once all the cheese is melted, let simmer (stirring regularly) for an extra 5 – 10 minutes. All that is left is open up the chips and dip in to taste! The dip can be served immediately or in the fridge for up to 2 weeks or freezer for a year. When re-heating you can use a microwave on heat level 5, or on the stove over med-low heat. Just be sure to keep stirring so the bottom does not stick and burn on the bottom of the pan. Call over a few friends, put the game on and dip in. VEGETARIAN: You can easily make this vegetarian by skipping the ground beef – just saute the onions and add in the vegetarian re-fried beans (increase to 2 cans) then take it from there. OTHER CHEESES: Can’t find Velveeta – no worries – go to the chip isle and pick up the cheese dip next to the tortilla or cheese wiz in a pinch. OR go old school and just use shredded cheese mixes – cheddar in combo with the mexican cheese mixes so readily available in the refrigerated sections. OTHER MEAT: You can use a ground chicken or ground turkey instead of ground beef if you desire. It will not impact the over-all flavor. Posted by culinaryease on November 5, 2013 in General Cooking, Parties, Appetizers, and More, Recipes and tagged Bean Dip, Cheese Dip, DIP, hamburger, Super Bowl, taco dip. This year has been a long growing season for tomatoes, but alas the weather is turning colder (at least in the north-east). It is time to pluck those last remaining tomatoes from your garden and hopefully they are a nice deep green. There are many ways to enjoy those emerald gems, but one I found that sent everyone raving on the night of game 3 of the World Series and that fateful call against the Red Sox on Saturday, was the simple Fried Green Tomatoes. Out of all the dishes there, and a number I brought that I slaved over, this simple dish was the clear winner of the night. It is easy, the time-consuming part comes in doing the triple steps for the breading, but well worth it. Get out that vegetable oil, dutch oven/deep pot and find out what all those southerners have known since childhood to be some of the best food out there. I assume you don’t have a deep fryer – if you do – all the better. But any pan with sides at least 4 inches high will be enough (if you are using a fry pan, use less oil, and sear on both sides). This recipe gives these delicious bites a little bite. that is the cayenne pepper. If you don’t want that heat, you can omit it or reduce the amounts. You can also substitute a few drops of tobacco in the wet mixture if desired. The little kick was great. I don’t eat spicy hot food, and these were ok for me to eat. Slice the top and thinly slice the bottom off the tomato. Slice the tomato into 1/4 rounds, set aside. In a small bowl, whisk together the Flour mixture to evenly combine. Prepare a baking sheet lined with parchment paper, or place a wire cooking rack on top. Line up the bowls/platters in an assembly line: Tomatoes, flour, wet mixture, coating and baking sheet. You can do one at a time, or a couple at a time. I usually use tongs so my fingers don’t get caked going from dry to wet to dry – but that is fine too, you just may need to wash your hands a few times. So, first you toss the slice in the flour to lightly coat. shake off excess flour (hand as perfectly fine for this step). Second, dip it in the wet mixture to evenly coat, shaking off extra – i twirl it around the bowl to release the extra. this is where I use tongs. Third, place the round into the coating mix, and sprinkle the top with some of the mix, and press down, then flip over and press down again so the coating sticks to each side. Fourth, Place on the baking sheet/wire cooling rack to set. Repeat until all rounds have been floured, dipped and coated. Cooking: Heat the oil in a pot and bring to 350 degrees (you can use a candy thermometer you can easily find these in the “kitchen” section of the grocery store. They are not expensive and a great tool to have). Prepare a second baking sheet with a wire cooling rack or lined with paper towels. Once the oil is ready, using tongs or a metal slotted spoon, lower the slices into the oil (add multiple slices, but don’t over crowd as the oil will drop in temperature and the slices will end up steaming vs frying, ex: if you think the pan can old 8, put in 4 – 5). This may take several batches to complete. No problem. Flip/ after 30 seconds to a minute to set both sides, and prevent sticking. Cook until golden brown throughout and the edges are slightly darker. About 3 – 4 minutes in total. Remove the slices either with a tong or metal slotted spoon to the prepared baking sheet to cook and remove extra oil. Once all the slices are done, if you are not serving immediately, let cool and leave at room temperature. When ready to serve, place in a 350 degree oven for about 15 – 20 minutes until heated through and the coating re-crisps. I would not recommend doing these the day before. Doing earlier in the same day is fine. What to serve with these delicious bites? Remoulade of course! Mix all in a bowl until smooth and all ingredients and mixed together. Taste and adjust with more horseradish, Tabasco, mustard or mayo to suit your taste buds. Use the sauce for dipping the green delicious rounds – or serve the rounds, with a dollop of the sauce and top with a couple of pieces of fresh micro herbs. I hope you had a bountiful tomato season and can use this recipe. It is very yummy. Posted by culinaryease on October 27, 2013 in General Cooking, Parties, Appetizers, and More, Recipes, Side Dish, Vegan/Vegetarian and tagged Bread crumbs, cornmeal, Fried green tomatoes, green tomatoes, panko, remoulade, Tomato. Summer is upon us and family and friends looking to come and spend the weekend with you. What do you do that is fast and simple so everyone is fed for breakfast? 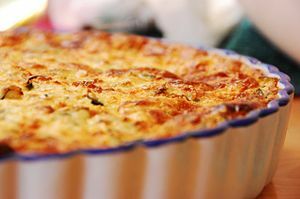 Why not some Quiche – yes it is for men too. It is a fully loaded breakfast dish that can be made ahead, reheated the morning of and then everyone can just help themselves as they get out of bed and head to the coffee machine. The best part it can be served hot or at room temperature. Almost my entire family (up to about 20 immediate family members) were visiting for the memorial day weekend. My mom left a dish at my house from a previous party so I figured I would bring it back with breakfast int it. The other good thing is, you can make it with a crust or without a crust. I made it both ways as I have a sister who is on a gluten free eating life style. While I make this with Kielbasa, it can easy be made without the sausage to make it vegetarian. You can also substitute the kielbasa with any sausage, ham, turkey, left over chicken, etc.. And the cheese can be substituted for any cheese you like. You can also add additional vegetables like Broccoli, cauliflower, eggplant, etc.. The options are endless. The main note is, be sure when you sauté whatever vegetables you use, you cook them and give them time to release all of the liquid and cool down. If they retain the liquid (like tomatoes, zucchini, summer squash) it will make the quiche runny and/or soggy as the liquids will release when further cooked. This recipe is enough to fill a 9×13 baking pan and then a little more. You can use 2 – 3 pie pans (may need to double the crust recipe) or have a second small pan on the side to finish cooking the remaining ingredients. I do this by hand because it is fun and you can tell when it is done. But you can use a food processor if you wish. In a large bowl, add the flour and salt. Mix together. Add in the butter and start crumbling the butter with the flour mixture working it until you have a bunch of pea sized butter clumps covered in flour. Add in the fresh herbs (if using) and mix into the mixture. Start adding in the ice water, about 2 TBS to start and add additional until you can form a ball and all crumbs are incorporated. It can be made a couple days in advance at this point. When you are ready to roll it out, take the ball out of the refrigerator and let sit at room temperature for about 1 – 2 hours before rolling the dough. If it is too cold when you start to roll it out, it will split and then shrink in the pan when baking it. Roll out the dough to fit the pan(s) you are using. Form the dough in the pan and poke holes all over the bottom (I use a fork). Cover with tin foil and place pie weights on top of the tin foil to keep the dough from shrinking during the pre-bake. Bake about 20 minutes, then remove the tin foil, but be sure to cover the edges so they do not over cook. Bake another 20 minutes until the dough is fully cooked and just beginning to brown on the bottom. Add the olive oil to a large pan over med to med-high heat. Saute the onions and peppers for about 5 – 7 minutes letting the liquid dry out or strain the vegetables from the liquid. In the pre-baked crust, add the sautéed vegetables and scatter to cover as much of the bottom of the crust as you can. Then sprinkle the goat cheese, Italian cheese and kielbasa over the entire crust. In a large bowl, add in the eggs, cream, pepper and a few pinches of salt. Whisk until just beginning to froth. Pour the egg mixture into the crust completely covering the vegetables and cheese. Pour enough in to come just below the top of the crust. Bake for about 35 – 45 minutes until the top browns and when you insert a knife it comes out just about clean (ok if a little egg sticks as it will continue to cook when you pull it out of the oven). Serve or let cool to room temperature and freeze or refrigerate. To reheat – heat the oven to 35 degrees and cook about 30 minutes. Breakfast for 8. It is quick and easy.. To make it even easier, use pre-bought pie crusts in the pan or don’t use a crust. This freezes very well and your guests will love it. Posted by culinaryease on June 18, 2013 in Cooking for two or less, General Cooking, Parties, Appetizers, and More, Recipes, Vegan/Vegetarian and tagged Bell pepper, Cream, Goat cheese, kielbasa, pie crust, Quiche. I have made this dish a few times now and whenever ANYONE takes a bite, their eyes roll back and only sounds of pure delight escape. I have heard it described as many wondrous food experiences, and to really capture it, the sultry Tango dance probably best describes what happens when you take that bite. I have been asked for this recipe by many people… or the question – HOW DID YOU DO THIS? What is pork belly and what makes it so delicious? Pork belly is a fatty slab of meat connected near the pork loin and pork spare ribs. This section of meat is typically used to make bacon (smoked) or panchetta (cured). Basically, uncured and unsmoked bacon. 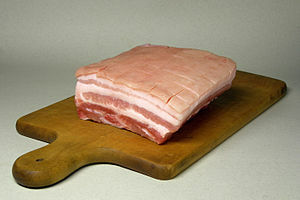 Pork belly can be sold in slabs (slab bacon is already cured and/or smoked) or in 1.5 – 2 in wide strips. Depending on where you live, this can be readily found. In other locations, you may have to special order it from a butcher or you can find it on line. If you cannot find it or don’t want to pay the shipping (can cost as much as the pork), you could substitute country style pork ribs or pork spare ribs. **Note, you could leave the skin on, but I don’t. If you notice in the picture above, the skin is “scored” – (ie: Checker pattern cut into the skin). The purpose of scoring the skin is to allow the rub to reach the meat. You can cut the skin off and fry it for some great cracklin. When I do this, I use about 4 LBS to serve about 15 – 20 people in a appetizer size (don’t really need more than this). If using the spare ribs, leave the bone in but double the amount you purchase as the bones will add a bit to the total weight. You may also need to double the amount of rub as you will have twice the surface to cover. IF substituting another cut of pork, be sure to get some good bacon (about 4-6 slices) to dice up and add flavor and fat when sautéing the vegetables. Did I mention this is NOT low fat? That answers the question – WHAT MAKES THIS SO DELICIOUS. But it is also the reason for my suggestion to keep it to small serving sizes or as an appetizer. I use a pressure cooker to make this, as I first came up with this combination, interest and process when playing with my new toy. While I use the pressure cooker, you don’t have to. I am writing the instructions for non-pressure cooker. Note: You need at least 3 – 4 days to make this. This is a PLAN AHEAD recipe. Not much actual time in front of the stove or in the kitchen, but curing, resting, and braising time. 4 LBS Pork Belly, cut into 3in long by 1.5in wide strips (skin removed, if attached). The reason to cut into strips is to expose as much rub to the pork as possible. 1.) Thoroughly mix all in a bowl. Spread the pork on a plate or baking sheet and coat the pork on all sides using all of the rub/cure. 2.) Place the pork into a gallon sized zip lock bag (or divide between multiple bags). Do you still have more rub, dump it in and massage the pork to spread it around. When ready, squish out as much air as possible and seal the bag. 3.) Refrigerate on a plate or platter (may leak as the moisture releases from the cure) for 2 days (about 48 hours). Turn the bag over a couple times during this process. This is to allow the juices to marinate each side. 4.) After the 2 days, remove from the bag and rinse as best you can under cold water. Some of the rub will stick to the fat so it is ok to have speckles. This will release when you brown it. 5.) Take out a baking sheet, place a cooling rack over the baking sheet. After you rinse the pork, place on the rack and then in the refrigerator, UNCOVERED, for another 4 – 6 hours to dry out. 1.) Move the pork to a dish to hold, and wash the cooking rack as you will re-use this for the cooked meat. Unless you have more, then get out a fresh one. Having the grate over a baking sheet will allow the fat to drip off. Don’t wory about losing any flavor, there is plenty of fat for multiple renderings.. 😉 Don’t have a grate? Line a baking sheet with paper towels instead. 2.) In a heavy bottom oven and stove proof pan (ideal, however, if you don’t have one that can do both, just have a pot with a lid that can be used on the stove and at minimum 8qt capacity), heat over Med Heat. 3.) This is where you put the apron on. 4.) Sear and brown the pork on all sides. Do in batches so you do not over crowd the pan. You want to sear that fat. It is OK if it is darker brown than you expected (even burnt – can always cut it off – enough fat to recover). The sugar from the rub will make it brown pretty fast. You want it crispy on the outside. 5.) Remove the pork to the baking sheet. Continue until all the pork is seared. 6.) Your pan/pot will have lots of fat and lots of bits left over from the rub in it. Pour the HOT fat, grits and all, into a glass or metal can. Wipe out the pan with a paper towel. Don’t worry about getting all the bits out, but as much as you comfortably can. 7.) The good thing about bits is that they are heavier than the fat, so from the top of the glass dish/metal can you used, add back about 3 TBS of fat back into the pan. 8.) Increase the heat to med-high and add in the carrots, onions, celery, garlic, bay leaves and herbs. Stir every couple of minutes until the carrots start to brown (about 10 minutes). 9.) When the carrots are browned. Add in the wine and let simmer about 3 minutes. 10.) Add in the chicken stock, stir and let go for about 2 minutes. 11.) Add in the pork and stir and cover as much of the pork as possible. Add additional chicken stock (or water – don’t worry water will be flavored and evaporate out in other steps) if necessary. It is ok to have part of the pork poking out of the liquid. 12.) Bring the whole thing to a simmer, about 10 minutes. 14.) Check it, stir gently (don’t want to break up the pork), and replace the cover, slightly askew (so you have a good sized vent while it continues to cook. 15.) Cook another 45 minutes, then check it for doneness. It is done if you try to pick out out of piece of pork with tongs and it starts to break apart. It if doesn’t want to fall apart when you look at it, it is NOT done. Put it back in for another 30 minutes. Test again, and then do 15 minute intervals until it is done. 16.) When done, remove it from the pan and place on the rack to cool down. 17.) Now, place a large fine mesh colander over a large bowl, and strain the chunks out of the liquid. Press down to release more of the liquid from the vegetables. Toss the vegetables, but KEEP the liquid. 18.) Place the liquid into a large stock pot (can be same pan used to cook the pork) and bring to a solid simmer. reduce the liquid by 1/3rd. So if you have 3 cups of liquid, you should end up with 2 cups. Taste. If it tastes watery, then continue to simmer another 15 minutes and check again. REMEMBER – there will be a lot of fat on the surface of the sauce. You can skim this off now, or wait. Make sure you stir it up a bit so when you taste you are not getting a mouth full of fat. 19.) Now you are going to be disappointed. Sorry about this, but it is still not time to eat it… Although I still taste test about now. What i do is take 1/2 of one of the pieces of pork, over med high heat (need that apron again – it will splatter), sear the pork again on all sides, and then pour a little sauce over it and taste. Yumm.. BUT you are not done yet. 20.) With braising, being able to let all of this goodness sit over night it a BIG key. It only gets better. Put the sauce in a ziplock bag or container and the pork in a separate bag or container and refrigerate over night. 21.) Magically – the sauce will separate allowing you to easily remove the extra fat and have a beautiful sauce to serve with your pork. Yes, we are finally here. Hopefully, you will agree that while there were many steps, these last few make it worth your while. As I mentioned at the beginning, no one will walk away less than fulfilled. 1.) When you are ready, take out the pork, slice in to 1 inch cubes and let sit at room temperature about 15 minutes. 2.) Add the sauce back to a sauce pan over low heat, just to make it nice and warm. 4.) Add the pork to the pan, leaving space in between each to allow it to sear nice and brown on all sides making the outer-edges nice and crispy while the interior is soft and juicy. You may have to do this in batches. 5.) Place the pork into a large bowl with appetizer plates on the side, or other individual dishes and spoon the sauce over top. Then serve hot with a spoon. You can use a fork, but the spoon will allow the sauce to enjoyed with the deliciousness. Serve French Dip Style (dip the bun in the sauce, then top with the pork), or just on a bun with pickled red onions, or other accompaniments. I hope you enjoy this as much as everyone I have served. Posted by culinaryease on June 11, 2013 in Parties, Appetizers, and More, Recipes and tagged Bacon, Braised Pork, Braised Pork Belly, Braising, Pork, Pork Belly, Porkbelly, Spare ribs. A wonderful woman whom I met at a fun food event in NYC recently, forwarded me this classic Italian recipe. This would be a great dish to bring for picnics or outdoor gatherings as there are no ingredients that would spoil in the sun and it is delicious! It is also a nice side dish for a meal any time. OPTIONS: Toss with some orzo, rice or other pasta to turn it into a main dish. While the main feature of this dish is eggplant, I see no reason summer squash and zucchini can’t be used as substitutes or added. It would be delicious. And to spice it up, with the summer growing season on us, toss in a little hot peppers. If you are adding ingredients to the list below, be sure to increase the vinegar, sugar and oil slightly (start with 1 TBS vinegar to a pinch of sugar). For the oil, be sure the oil is enough to coat the vegetables when added to the sauté pan. Add in the vegetables (eggplant, red and green peppers, celery, onion, olives) and sauté (fry) them in the oil. Stir every minute or so until the eggplant is a nice golden brown on all sides (about 7 – 10 minutes). When they are almost cooked through and the eggplant a nice color, place them in a bowl and set aside. They will continue to cook as they are still hot. Add the vinegar and the sugar to the same pan and heat over med heat until the sugar dissolves ( about 2 minutes). When the vinegar is dissolved, add the vegetables back into the fry pan, toss with the vinegar and then let them boil in the sugar/vinegar solution for – 5 – 10 minutes. Stir often making sure nothing is burned and flavors are blending together. It is now ready to serve, hot, cold or room (outdoor) temperature. This recipe can also be made and pickled for future use as a relish, added to a chicken, pasta dish for extra flavor or used as a topping on some toasted bread for an appetizer. Place the cooked mixture in pickling jars. Boil jars 2-3 minutes to kill any bacteria. Let the jars cool and then place them in a cool place. Can keep for 3 to 6 months. Enjoy. I do see this on the menu for my July barbecue. 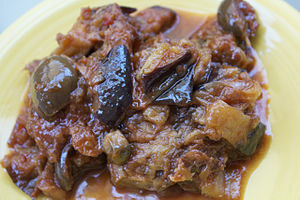 Posted by culinaryease on June 4, 2013 in Cooking for two or less, General Cooking, Parties, Appetizers, and More, Recipes, Side Dish, Vegan/Vegetarian and tagged Eggplant, Italian Relish, Pickling, relish, summer squash, Sunflower oil, Vinegar, yellow squash, Zucchini. It is a nice chilly slightly overcast May day out and I am in the mood for some sausage and Sauerkraut. To start, I want to make sure I have some great deli mustard, slightly spicy, and some nice deli rolls (like hoagie rolls). No hotdog buns for this hearty sausage delight. I chose to braise the sauerkraut with the brats and knockwursts to impart more flavor, but to also take some of the bite out of the sauerkraut. BY all means, use the sauerkraut as purchased right out of the bag if you prefer. 1.) In a large stockpot (6 – 8 quarts) over med-high heat, add the garlic and sauté for about 45 seconds. 3.) Add in the sausage (you can cut in half if you prefer) and be sure the liquid covers the sausage. Let simmer about 20 – 25 minutes. 5.) Once the sausage is cooked, remove from the sauerkraut broth. Set aside. 7.) Finish off the sausage, on the grill or in a sauté pan, over med heat, add the sausage and let brown on all sides ( as best you can, it will roll around). 8.) On the toasted bun, put a little mustard on the bottom, add the sauerkraut and onions, then top with the sausage. Add more mustard if you would like. Then grab a lawn chair, some napkins and eat away! Posted by culinaryease on May 28, 2013 in Cooking for two or less, General Cooking, Parties, Appetizers, and More, Recipes and tagged braised, braised sausage, brats, bratwurst, german sausage, knockwurst, Sauerkraut, Sausage. Maybe I was just really hungry, but I ate two and did not stop to talk or anything until they were gone. Summer and Lobster season is approaching, while I typically prefer steamed lobster with butter, I decided to give creating a lobster roll a try. While this just shows the lettuce wrap, you can even bring this to greater heights by putting it on a buttered and toasted split bun New England Style. I would have wolfed those down, but forgot to get the right rolls, but I had the lettuce. I was not disappointed as you can see from my first sentence. Makes two good sized wraps or rolls. Note: You can also do this with shrimp, crab or scallops, You would need about 12 medium sized shrimp, 5-6 large sea scallops or a cup of bay scallops. All can be prepared the same way. You will need at least two large pieces of Boston Lettuce for the wrap, or your other favorite kind of lettuce. Two NE Style top split buns. Butter the insides of the roll, and place butter side down in a pan over med-heat. Press down so the entire inside makes contact with the pan. You may have to hold it with a spatula to keep it down. Poach the Lobster: You can leave it in the shell or removing it from the shell (If cooked already, remove it from the shell and give it a large dice). In a medium sauté pan, over med heat, add the butter, oil and lemon juice. Bring to a light simmer. Add in the lobster (if tail, soft side down first) sprinkle with a little salt and pepper. Let simmer and cover loosely (tilt it so the steam does escape a little). After about 4 minutes (for a whole tail, less time depending on if already chopped or cooked), flip it over and finish simmering for another 3 – 4 minutes until fully cooked. Remove from the pan and let cool until it can be handled. Make the mayo: Combine all the dressing ingredients in a bowl and stir to combine, you may need to mash the avocado a little to get it to blend. It is OK to have small chunks. Taste, adjust with salt, pepper or a little more mayo, mustard, etc.. as needed. Add just a little at a time. In a separate bowl, add the lobster. Then start with 1.5 TBS of the mayo mixture and stir to mix well. If more mayo is needed, add more about .5 TBS at a time. If you have leftover may – GREAT! It is a great spread for sandwiches of all kinds. NOW – spoon it into those buttered heated buns or crispy lettuce leaves, turn off the phones and email, and take a bite. yummmm. Best if it is still slightly warm, but still great if chilled. VEGETARIAN: Make a Potato Salad, cut up potatoes into cubes, and boil in vegetable broth, strain and toss with the mayo. Yummy! Or Use sauted mushrooms, corn, cucumbers, even tofu! Save any extra mayo or lobster (yea right) covered in the fridge for up to 3 days. Let me know what you think, especially if you are from New England. Posted by culinaryease on May 21, 2013 in Cooking for two or less, General Cooking, Recipes, Side Dish, Vegan/Vegetarian and tagged Lettuce Wrap, Lobster, Lobster Lettuce Wrap, lobster roll, Lobster Salad, New England, potato salad, Shrimp Salad, Shrimp Salad Lettuce Wrap. This is a great easy recipe for a cheesy pub / fondue dip. Get out some warm bread, warm pretzles, or even veggies if you wish and prepare this simple and quick dip. ** The types of cheese can be changed based on what you like. Just make sure it adds up to 2 – 2.5 cups. In a sauce pan, rub the garlic around the bottom and edges of the pan. Over med heat, add the butter to the pan, and using a wooden spoon or heat resistant spatula, stir the garlic and butter together until the garlic is soft. In the mean time, combine all the shredded cheese, flour, mustard, salt, and pepper. Toss to coat the cheese evenly. After the beer mixture has simmered for 3 minutes, add in the cheese mixture. Stir constantly until all is mixed in well and you have a smooth creamy sauce. Serve with bread cubes, carrots/celery, as an alternative cheese topping to cheese steaks, spread on sandwiches, etc. Can easily be reheated over low heat in the microwave or stove top. Posted by culinaryease on May 7, 2013 in General Cooking, Parties, Appetizers, and More, Recipes, Side Dish, Vegan/Vegetarian and tagged Cheese Dip, Cheese fondue, Cheese spread, melted cheese, philly cheese steaks. Or just a cleaver disguise for a cold cut roll up? I had something like this in a restaurant in Minneapolis during a recent visit and thought, why haven’t I thought of this? I LOVE LOVE LOVE Dill Pickles, not the sweet kind, but Dill. Eat them almost every day; whole, halves, spears, hamburger chips, gherkins, relish, etc.. I chop them up and add them to tuna and chicken salads, my version of a big mac sauce, and just plain ol sit down with a jar and go to town. In a way I have done something like this recipe as a snack, but I am not including that because then I have to admit I like Miracle Whip, which I do with Ham and pickles. I am on a tangent so back to pickle sushi. It is really just a pickle roll up with deli meat and a delicious cheese spread. The below is my version, but there are a TON of variations you can do if you just get creative with spreads, condiments even replacing pickles with other items like celery, carrots, bell peppers or even hot peppers. The beauty of these is they make quick snacks, appetizers or a lunch replacement. My dog even loves these. Must be the cheese and meat and he doesn’t even realize he is eating a pickle. Put the feta cheese, cream cheese and pesto in a small food processor or blender and process until almost smooth. Ok for there to be some lumps. Place a pickle spear in the bottom 3rd of the deli slice, and roll up. Repeat for all deli slices. Slice off any extra meat from the ends, then slice into 1 inch pieces. Place on a platter, with toothpicks and enjoy! Or if just for you, forget even slicing them, just eat the whole thing. If you have extra, wrap each roll tightly in plastic wrap and refrigerate for later use. Eat within 3 days. Mix 2 TBS cream cheese with 2 TBS ranch dressing and use that as the spread in place of Step 1 – and you don’t even have to get out the food processor or blender. Mix your favorite mustard (2 TBS) with the 3TBS cream cheese or mayo in place of Step 1 – and you don’t even have to get out the food processor or blender. Add 1/4 of fresh avocado to the cheese sauce. Posted by culinaryease on April 30, 2013 in Cooking for two or less, General Cooking, Parties, Appetizers, and More, Recipes, Side Dish and tagged Appetizer, Cold cut, Cream cheese, Deli Meat Roll up, Feta, Pickle Roll Up, Pickle Sushi.